2004 Borders Original Voices Selection. lively depictions of nocturnal animals. Come along, and let the nocturnal adventure begin! High above the ground, in the heart of a beautiful and swampy rain forest, a small green frog with big red eyes is rousing from his daytime slumber, in the cradle of a leaf. "I love the night," croaks the tiny tree frog. "It is so fabulously fabulous for calling to my companions and for creeping across the canopy." picture book that you and your family will come back to again and again. 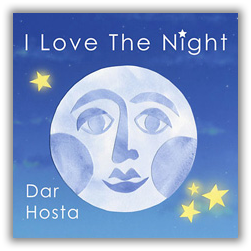 I Love The Night is a delightful and original children’s picture book remarkably enhanced with unique, paper collage creations... especially recommended for children ages 3 to 8. You may purchase I Love The Night through Etsy with totally secure online credit card transactions. You will receive your book within 7-14 business days. You may also purchase through Amazon.